One of the glorious issues of a 20-year marriage is the honesty, brutal, albeit “loving,” honesty. Here’s the thing, Graham has never been head-over-heels-in-love with my pies. He always loves bits and pieces of them, but never the entire pie. Can you imagine what that does to a girl who prides herself on figuring out all things sugary. Believe me when I say that I have been on a 20-year mission to create THE perfect pie. Not just a great crust, or filling, but the entire package. Well, I can breathe a sigh of relief, and have a moment of marital bliss … because, he declared this apple pie “the best pie I have EVER eaten.” You can not know how important this day has been for me, as a professional pastry chef, as a wife and as a perfectionist. Challenge met. To celebrate this victory I am teaming up with the fabulous folks at Emile Henry to give away three Apple-Red 12-Inch Pie Dishes , just in time for Thanksgiving. *See the bottom of the post for details on how to win. Giveaway is finished! The keys to my winning apple pie were the apples, I used 6 different varieties, because it is apple season in MN and there are so many gorgeous apples to choose from. They all have different flavors, textures and colors. I like to mix them to create a more interesting pie, although I think you can get a very good result with just two kinds. Then there is the crust, which was made with 100% LARD. Yep, unless you are vegetarian, you really need to try it. I am madly in love with lard. It requires a slightly gentle touch, but follow my directions and it will be tender, flaky and delicious! 1 teaspoon apple cider vinegar, actually any white vinegar will do. 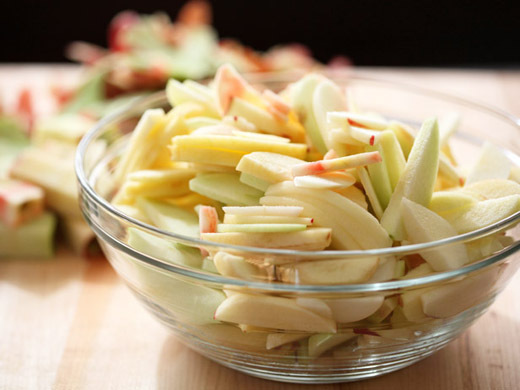 3 pounds thinly sliced apples (about 4 pounds whole) – I used a combination of Haralson, Braeburn, Cortland, McIntosh, Gala and Granny Smith. Feel free to use your favorites, but be sure to use some that will keep their shape when baked. 1 cup raw Turbinado sugar – this gives a richer flavor than regular sugar. You can also use brown sugar, but may have to adjust amount if using sweeter apples. Have all of your ingredients ready and chilled. If it is hot out I even put the flour in the freezer for a little while, which makes it easier to work with. Combine the flour, salt and sugar. Add the lard. 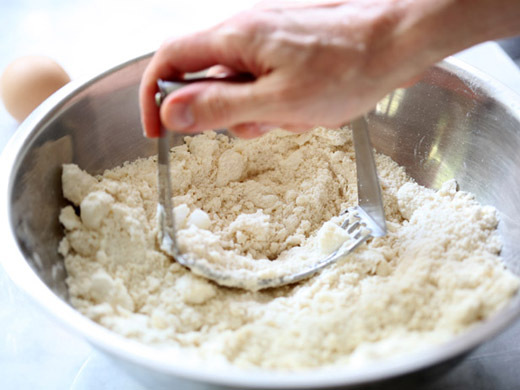 Use a Pastry Cutter or your hands to work the lard into the flour. 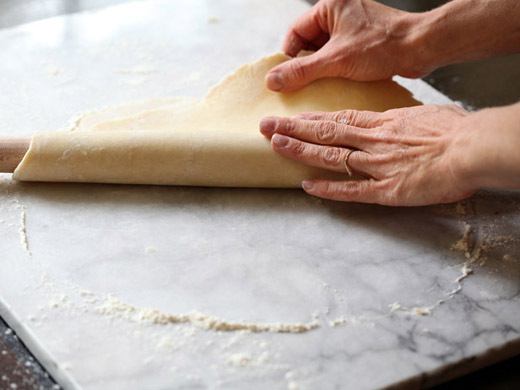 (When using lard I like the pastry cutter, because my hands tend to be warm and the lard gets too mushy.) Work the lard into the flour until it starts to stick together when squeezed, but you want to keep some of the lard in pea-sized pieces. If the lard is too soft and it won’t stay in pieces, place the bowl in the freezer for about 15 minutes and then try again. Whisk the egg, add it along with the water and vinegar to the flour/lard mixture. Stir this with your hand or a wooden spoon, but be very gentle. The goal is to keep the pea-sized chunks of lard in tact. 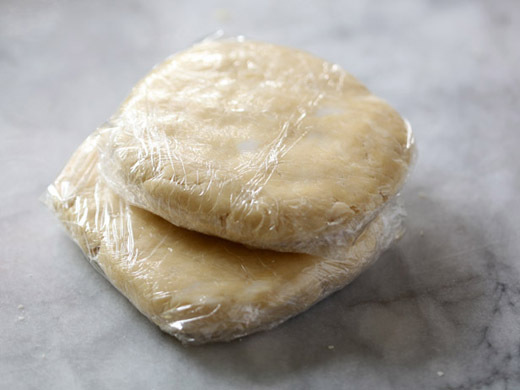 Wrap the dough in plastic and refrigerate for at least an hour, or overnight. 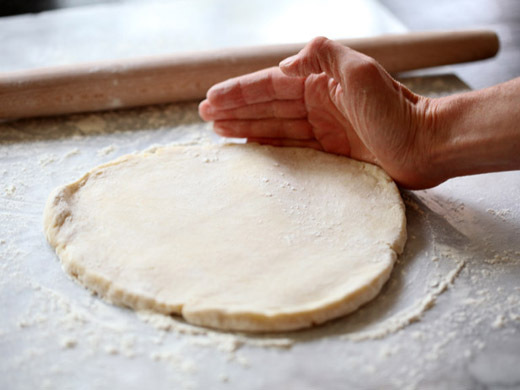 When you are ready to prepare the pie, roll one of the disks out on a well floured surface. 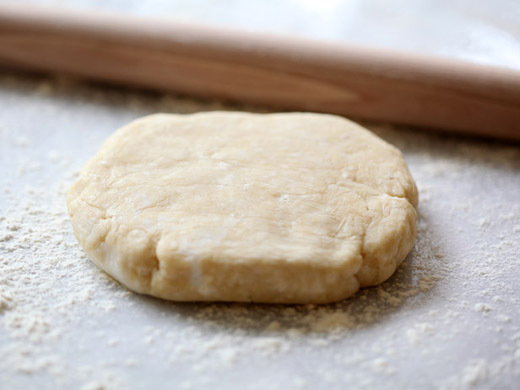 If the dough seems hard, let it sit at room temperature for about 10 to 15 minutes. This will prevent the edges from cracking too much. 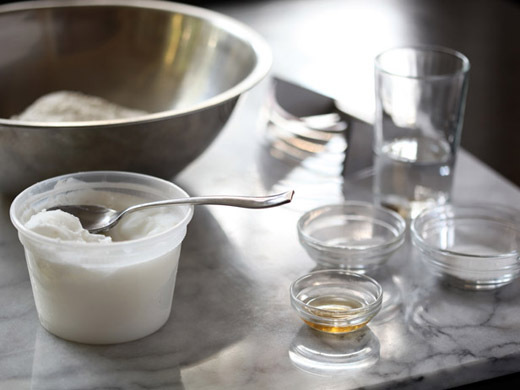 You still want the dough to be chilled, so the lard doesn’t get too soft. As you are rolling, you can round out the edges with your hands. Cracking edges are part of the beast, but this will help to keep them smoother. Once you have it rolled out to about 1/8-inch thick round, measure the dough to make sure it will fit the 12-inch pie plate. I usually just hold the plate over the dough and eye it. There should be about 2-inches of extra dough beyond the bottom of the plate. 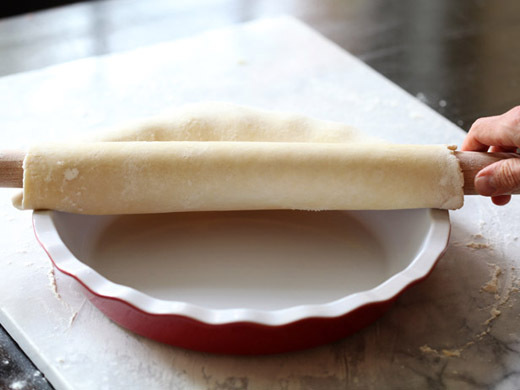 Fold the dough over the rolling pin to lift it. Lift it over the plate. and gently fit the crust into the plate. Do NOT trim the edges yet. Set the crust in the freezer while you prepare the filling. Preheat the oven to 425°F, with the rack at the bottom 1/3 of the oven. 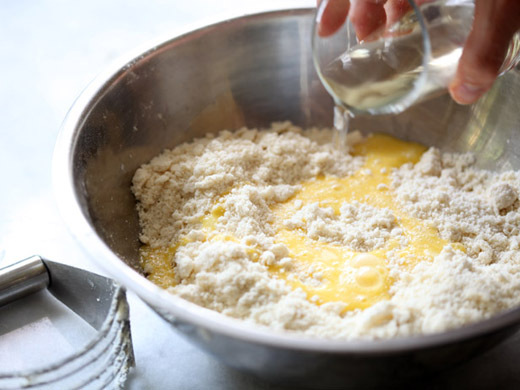 Mix together the sugar, spices, salt, and cake flour in a small bowl. Toss the apples with the lemon and then the sugar mixture. Put the apples in the chilled pie crust and place the pats of butter on top. Roll out the second piece of dough and lay it over the top. Trim the top layer of dough to cover the apples completely. 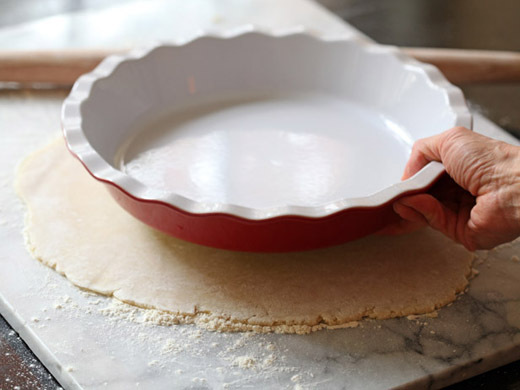 Fold the bottom crust over the top crust and then pinch them together in a decorative pattern. You can also use a fork to press them together. 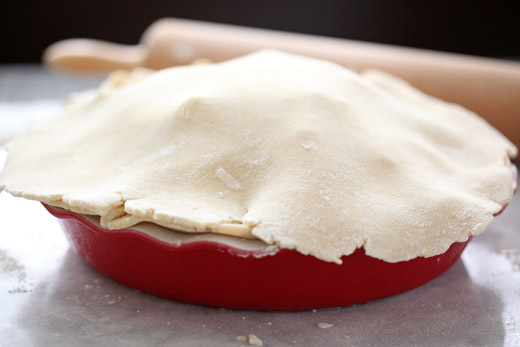 Put five 2-inch long slits on the top of the crust to allow steam to escape. Brush the top of the apple pie with the egg wash and then cover with the sugar. The filling should be bubbling and the crust golden-caramel-brown. Test the pie by poking the apples, through one of the slits, to see if they are soft. If they are still firm, bake the apple pie for another 10 to 15 minutes. so that the apples will be set up when you slice them. Enjoy apple pie a la mode or with nothing extra at all. *Next week I will pick three random winners for the Apple-Red Emile Henry 12-Inch Pie Dish. Please just leave a comment about your favorite pie recipe. The contest is only open to folks in the USA. Thanks! Giveaway is finished! Looks good. I have been meaning to make an apple pie with the Michigan apples in my frig. Now that I see your beautiful pie I think I will get right to it. I usually don’t do sugar on top but I may try it. My favorite pie recipe that I’ve made to date has to be the Bumbleberry Pie. Like your pie with several types of apples, this pie has every berry you can think of! I’ve given my two best friends Emile Henry dishes this year and would LOVE to win one for myself! Sour cherry pie. Its no fun to pit all those cherries, but its so worthwhile. I can’t wait for the holidays just so I can start pie making. I adore a recipe that I found at Saveur for a Ginger Peach Pie, but I am looking forward to trying your pie. Gorgeous photos for method, such a great post! I am 100% in love with this pie. I looks like the ultimate apple pie. My favorite pie recipe so far has been the peach hand pies I made over the summer. They were the perfect size for snacking. This pie looks amazing! I can’t wait to try it. My favorite pie is definitely apple– recently I attempted a salted caramel apple pie that was divine. I used America’s Test Kitchen’s pie dough recipe that uses vodka for moisture. Perfect every time! We did not have nearly as many berries this year as last – enough for only one pie. Your apple pie looks fabulous – thanks for sharing it! My mom’s apple pie recipe is the best ever. I’ve tried to make it like she does many times, but it never is quite like mom’s. My favorite pie is s’mores pie- Totally nontraditional, but gooey, chocolatey, and oh so good! Any recommendations for revamping this for a 9-inch pie? It looks delicious, and my husband has requested a pie for his birthday dessert. Thanks! I love a good mixed berry pie, but I have a major soft spot for apple pies in the fall. Congrats on winning over the husband! I have been on the same mission to convert my husband on certain dishes before and it is such a victory when they love what you created 🙂 Gorgeous pie! Your apple pie looks perfect. Looking foward to following your great directions. I need work on my crust…plus I know the Emile Henry pie plate will help! My favorite pie that I know how to make is a ginger peach pie. I had a pumpkin pear pie at Birchwood once though and that was probably my favorite pie that I have eaten! 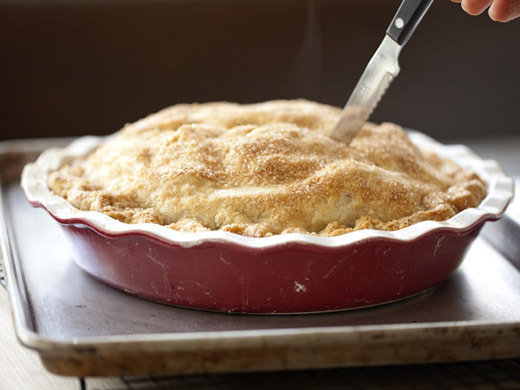 Wow – that does look like the best Apple pie ever…love the photo with the steam escaping from the top. Mmm.mmm.mmm! That apple pie looks amazing. My favorite pie is my Mom’s lemon pie. My mom’s apple pie is my favorite “recipe”. She used a crumble topping on hers, which was my favorite part – put your pie looks awesome! We all love apple pie at our house, but I don’t have a favorite recipe… yet! Will definitely have to try this recipe with the lard! I’ve got a bag full of apples just begging to be used. Your apple pie is making my mouth water! Apple pie is my favorite, too! I like my crust simple: flour, butter, and a little water. My favourite pie ever is strawberry-rhubarb. Seeing as I am not all that good at making pie and I don’t have a rhubarb plant, I haven’t had one for years. Sigh. First off, those pie photos look AMAZING!!! i love baking sweet things, but i love eating savory things, so I always try and find a way to combine both. I have an idea for an apple pie that has some bacon in it (and maybe maple) and a cheddar crumble topping on top. My favorite pie to make is an Old-Fashioned Lime Pie because it’s quick and easy and is so refreshing. My favorite pie to eat is apple… apple apple apple. My favorite pie is my Mom’s apple crumb pie. I love to make apple pie. This looks delicious! That looks amazing! Can’t wait to try it. My favorite pie was a pie my grandfather used to make. He couldn’t cook anything, but he made the best cottage cheese pie. It’s now a tradition that I make every year on father’s day for my dad. Just one favorite pie recipe??? I love a good berry pie in the summer, whether it’s triple berry or strawberry-rhubarb, and in winter, it’s hard to beat a rich pecan or sour cream raisin pie. Looks yummy, but I have to admit that I like crumble toppings better. I just made an apple pie with an oat stuesel and took it to a potluck and had requests to make another. What a beautiful pie! My favorite summer pie is a peach pie and my favorite winter pie is pumpkin. My all around favorite pie is a lemon Chess pie:) I do love pie! My favorite pie recipe is my Grandmother’s cherry pie. I put a layer of chocolate chips in the bottom before I pour in the filling and bake. Delicious! I don’t have a favorite full pie recipe, but I have a fabulous nutty whole wheat pie crust that is dying for this filling. I love almost every pie. My favorite to make for friends would be a variation of Paula Deen’s peanut butter pie, it’s so rich and wonderful. My favorite to eat would probably be simple pumpkin with homemade whipped cream… Now I want pie, which does not fit into my low carb diet! This pie looks wonderful. My favorite pie is banana cream with homemade custard. This pie looks delish! My all time favorite pie is banana cream. Yum! My favorite pie is a Tin Roof Fudge Pie. Any combination of peanuts, caramel, and chocolate is a win-win situation! AAAAH! Apple pie! Not only my favorite, but a favorite in my household. I learned early in my 24 years of marriage that I could please my bakery spoiled husband with my crust – “As good as moms!” but it took me a few tries to figure out why he didn’t like my apple filling as well. I was taking the time to slice the apples, similar to your photos, but that allowed the apples to retain the their shape, he prefers his apples to bake down into a, I hesitate to say it, but mush. I am looking forward to trying your suggestion for a combination of apples, but I am afraid I will have to look for types that will NOT retain their shape – but it would still look awesome in a Emile Henry pie dish. Beautiful-So many favorites…but today my favorite is lemon meringue-mountains of lovely toasty meringue. 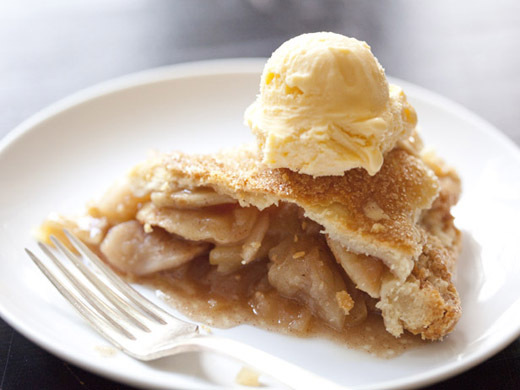 I love apple pie and I am dying to try your recipe!!! This Emile Henry pie plate would be perfect for my Thanksgiving table. I am not usually a pie person, but I met a recipe last Thanksgiving that changed my mind…. Spiced Pear Pie courtesy of Bon Appetit. It tasted divine, smelled delicious and looked absolutely beautiful. However, I think that this Apple Pie might give the pears a run for their money! I love to bake, but never seem to make pies. (Obviously don’t have favorite pie recipe) I’m always afraid that the bottom crust will be soggy and the filling too sweet. Your apple pie looks amazing, though, so maybe I will give it a try for Thanksgiving. We live in apple country (WA) and have abundance of gorgeous variety. And I think I would love to try a savory pie some time. One quick question that I’ve been meaning to ask for ages — is there an option to print the recipe text without the photos? Your step-by-step pictures are awesome but because I print out so many of your recipes, I end up with lots and lots of pages. Just wondering if I’m overlooking that button or link. Thanks! Unusual mincemeat is the best for Thanksgiving. Mincemeat pie with cheesecake on top. So yummy! I love pumpkin pie. I love everything about it. Fall is such a great time of year and all of the spices in the pie make me love it so much more. By the way- the giveaway is a brilliant idea. Thanks! Hmm…favorite pie? Caramel-pecan cheesecake (does that count?) or my grandma’s from-scratch banana cream. Mmm! I love pie. My favorites are apple – my recipe is very similar to yours – and pumpkin. Yum, yum! My favorite pie recipe is a blueberry one that I got from my ex-MIL (the only thing I kept from that marriage! 🙂 ). This one looks fabulous, though, and I have a bag of apples sitting on my counter – hopefully I’ll soon have a pie dish to bake it in! I can’t decide which is my favorite pie that I’ve made – either Rhubarb-Orange Cream pie (it’s not really a cream pie, it has beaten egg whites in the filling with orange juice concentrate) or Lemon Supreme pie – I tweaked a recipe that used a lemon filling atop a lemony cream cheese-whipped layer to use very tart lemon curd over a lemony cream cheese-whipped cream layer OR pumpkin (or sweet potato) pie. Maybe it depends on the time of year. This time of year, it would be pumpkin. My mom always used lard in her pie crusts. That’s the old-fashioned way. I’m pretty sure butter and/or shortening pie crusts are a more recent trend. I am a sucker for the classic apple pie! Thanks for sharing the recipe. I think I love any pie with fruit in it. However, one of my favorites is a Wild Blackberry with Sage Pie. Blackberries grow wild on the central coast and it’s just so much fun to grab a bowl pick some berries and literally throw them into a pie. Your apple pie looks so yummy. Hoping to have some downtime so that I can make your apple pie. Thanks for sharing. My grandmother’s apple pie recipe is still my favorite. Looks like a perfect pie! Don’t know if I’m brave enough to try lard. I make a cranberry apple streusel pie that is amazing. Pies are my most favorite dessert. I have an extra spicy pumpkin pie that I make every year — it makes your tongue tingle. One of my all-time favorites is a pie made by a cafeteria chain in the southwest. It has a milk chocolate-sour cream filling that is delicious. I’ve come close to duplicating it, but the original is still the best. Looks delicious. I grew up on a strawberry farm, so my favorite pie recipe is my grandma’s strawberry pie…the taste of summer! Oh how I love pie. My sister is a pie queen; Always willing to experiment and almost always successful. My favorite pie is blueberry. I miss Minnesota and it’s awesome orchards, the Mn State Fair (when a previous commenter mentioned Marjorie Johnson I had to laugh; she always was kicking our butts with her baked goods) and the awesome and kind Minnesotans. I will find lard and make this pie. It sounds perfect! I love pie, especially apple! I love baking with Mangalitsa lard. And apple pie is one of those desserts where if I’ve heated the lard too much as I rendered it and made it taste a bit porky, it’s totally okay. 😀 Apple pie is probably my favorite pie to make and eat. That pie looks incredible. I don’t really have a favorite but I’ve always wanted to make a pie with apples and cranberries, I don’t know why but it just sounds so good. My favorite pie recipe is the rustic raspberry-rhubarb pie my husband and I created this summer. It was the first year we had both raspberries and rhubarb from our garden. My husband used one of your pie crust recipes and I made the filling with raspberries & rhubarb (of course) and some apricot preserves, cinnamon, a little bit of sugar and arrowroot to thicken the juices. Along with being an avid gardener, my great-grandfather was an orchardist and grafted many fruit trees on their home-place in the South Texas area around San Antonio. To this day there are several pecan trees in my great-aunts’ yard that still offer up some of the largest, meatiest pecans I’ve ever eaten. As a kid, one of my favorite fall activities was to use this red springy contraption to pick up many brown grocery bags full of “just waiting to be baked” pecans (lots would be used for my grandmother Mom’s pralines as well). Needless to say, Granny’s Pecan Pie recipe is one of my all-time favorites and receiving an overflowing bag of pecans as Aunt Mar’s Christmas gift… well it just doesn’t get any better than that! I love lard. Especially for apple pies. Yours is beautiful. I sat in on a pie making demo hosted by the French Pastry school in chicago and the chef made a quince pie that was gorgeous and amazingly delicious. She pre-cooked the quince in a pressure cooker and took us step by step through every single element of pie making. I’ve been a cake girl for so long, but I’m seriously being swayed by pies now that fall is here. The story about your husband not liking parts of your pies makes me laugh – as I’ve in the same boat – until this weekend – nailed the crust and the blueberry filling! I’ll have to try this recipe next – I always struggle with the crust. My favorite is coconut cream … yummm! I like fresh strawberry and fresh blackberry. And I’m going to try your recipe. I like a good apple pie too, just haven’t had many really good ones. Thanks for the recipe and instructions. The pics are fabulous. The best pie I bake for the holidays is Bourbon Nut Pie and our nut of choice since moving to North Carolina is the pecan with the bourbon pick – Maker’s Mark. mmmmm pie!!!! My tummy is a-rumbling right now. My favorite pie hands down is chocolate cream pie. Forget baking a cake for my birthday, I want a rich, creamy, velvety chocolate cream pie with fresh whipped cream on top. Just like my mom makes. For me it’s a tie between apple and chocolate satin. Both are so good and have their place! It is too hard to pick a favorite pie. Here in northern Indiana we have such a fabulous array of locally grown fruit (mostly from Michigan, though I grow some of these in my backyard): peaches, blueberries, cherries, strawberries, apples, apricots, raspberries, gooseberries, etc. Making a pie from each of these fruits at the peak of the season is a delightful family tradition (along with having strawberry shortcake for dinner once a year). The best part for me is my children’s longing and enthusiasm for la tarte de la saison. One pie crust baked in a 12″ pie dish + bittersweet chocolate ganache + fresh bananas + pastry cream + fresh whipped cream + toasted shredded coconut + a drizzle of warmed ganache = best ever banana coconut cream pie. Don’t you think? That pie is a show stopper! I can imagine how delicious it is, because my grandmother made her apple pies nearly the same way (she used brown sugar). We could never wait the appropriate amount of time for them to cool before diving in. My favorite pie is huckleberry, made with fresh picked mountain berries. My favorite pie used to apple- I always give them as gifts because they’re so easy and cheap to make yet people always seem to be amazed by them- but this summer I tried a new recipe (I think from Bon Appetit) for a raspberry lime curd meringue pie which was the most amazing thing I have ever created, and is going to be my favorite pie for a long time. Plus it got me over my longtime fears of making meringue and curd! Cherry Pie has always been my favorite ever since I helped my grandpa pick them from his tree every summer. My family’s favorit is pumpkin pie, but mine is apple. I usually have a mixture of apples too. Your pie looks amazing! your pie looks lovely, zoe! my favorite pie is either a dutch apple (love the crumbly topping) or the peanut butter banana cream pie from the guys at Baked. so yum! My family’s favorite pie recipe is definitely Key Lime Pie. It’s surprisingly foolproof, with so few ingredients. In fact the next tree we’ll plant (here in N. California) will be a lime tree, in part because my kids want more pie! I make an amazing Pumpkin Chocolate Pie! I hate dealing with crust…but if I were braver I’d totally make this recipe! I love a good Persimmon pie. My mom grows Fuyu persimmons in her backyard in California and faithfully, she sends me a box of persimmons each Fall. I make a persimmon pie that’s a bit like apple pie but with persimmons. Not too many people have experienced the pleasure of a persimmons and Persimmon Pie is how I share it each Fall season! sour cherry 🙂 just the thought of it brings smile to my face and starts the salvia flowing …. My Dad always loved mincemeat pie. One Thanksgiving he said that to pass the “good” pie test, a slice had to hold the filling when tilted on its side. I watched in horror as he tilted his pie and the filling stayed intact!! It became standard practice with mincemeat pie and every year it brings back the Thanksgiving he first did it…we really miss him! Chocolate Haupia pie. Haupia is a custard made from the coconut. With ripped cream on top it is ONO! My favorite pie is coconut cream pie. My mother made the best and how I miss it. A close second would be my sister’s buttermilk pie. Both have wonderful memories attached to them — memories of family get-togethers. Looks beautiful! I have some apples at home begging to be put in a pie, but I’d like to get a few other varieties first. Like you, I love mixing different types. My favorite pie recipe is a blueberry and cranberry pie from the Moosewood Cookbook of desserts. It’s very easy and beautiful, especially for thanksgiving. The pie crust uses sour cream, which I’ve never used in any other recipes, and it’s a bit thicker and sturdier, but still goes well with the filling. My grandmother’s buttermilk pie is my (and my family’s) favorite. I’ve also sold dozens of them at bake sales and have frequent requests from the friends of friends for pies. Lemon meringue pie or pumpkin pie, depending on the season! Saveur had a killer apple pie recipe that included lemon zest in the filling. And I like the vodka pie crust recipe that Cooks Illustrated provided in years past. Looks wonderful (although I will be making mine without lard!). My favorite pie recipe is a kabocha squash pie that I make almost every year for Thanksgiving – it evokes the tradition of pumpkin pie but is a little bit different from the classic, and everyone always wants seconds. I would love to make it in a gorgeoue new pie dish! I love peach pie ala mode! I love to make a pumpkin pie with a struesel top. I roast the pumpkin and puree it, add sweetened condensed milk and fold in egg whites. On top is pecans, brown sugar, butter. It’s my favorite to make. I think my husband and kids would prefer your fabulous apple. My favorite pie? Well, it would either be hot pie or cold pie. Apple pie is hands down my favorite. Followed closely by pecan pie. My favorite pie is pumpkin, hands down. This recipe looks amazing! Pumpkin Pie has always been my favorite – many types over the years, but I admit I usually like it best with a graham cracker crust! Beautiful as always Zoe. When are we going to bake together again…Oh and do you have a free Sat in Jan or Feb for a book signing at Bret’s Table? Life is too short to eat bad pie and unfortunately most pies you buy are pretty bad. I love a good pie and the best ones are homemade. I make is a peach-Blueberry pie that is pretty wonderful in the summer. I adore good apple pie and will try your recipe. 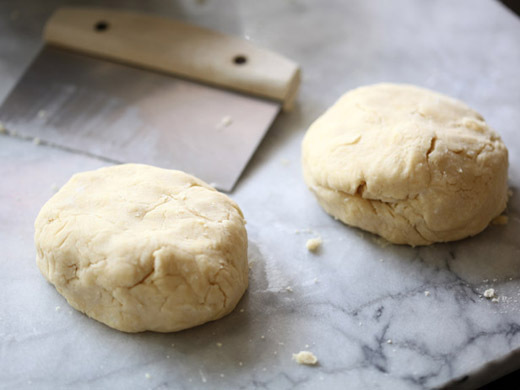 I have uses lard for biscuits and it makes a big difference. What kind do you use? I have heard about leaf lard- not sure what it is. My favorite has to be a german chocolate pie, with pumpkin pie running a close second! Thanks for your recipe! I love making desserts and pies are my favorite desserts to eat. I make apple, blueberry, or peach pies, all with fresh fruit and all-butter. I use ground tapioca to thicken the blueberry or peach pie. In apple pies, I usually just use flour for thickening. I almost always serve whipped cream that I make by hand with a dash of vanilla extract and some coconut date sugar. I love Pumpkin pie with pecans sprinkled on top! I can’t get enough this time of year! This looks lovely. My husband if very picky with his apple pie, he loves my filling but it is the crust that gets me. I’m never happy with it. Thanks for the tips, I will definitely try this. My personal fav is strawberry rhubard. My favorite pie….so hard to choose! Probably cherry… Though I make an amazing “french silk” pie too! There’s nothing better than a good old fashioned apple pie! I am looking forward to trying your recipe this weekend! I’ve been thinking apple pie and you’re the nudge I needed! I started to make a peach/blackberry pie and subbed blueberries when I couldn’t find blackberries. Didn’t tell the family about the sub and they raved anyway! Silly folks. I think that this is my new fav recipe! I also like using recipes with cooking apples first, reducing the juices/syrup to pour over before baking. Yum. This summer I started working on icebox pies. I made a lemon lime pie that was fantastic and a chocolate caramel pie that is my new inspiration for Christmas fudge. Now my husband is asking for me to move onto fruit pies. Thanks for the inspiration with this post. My favorite pie too make and eat is blueberry rhubarb. In the past couple weeks, I’ve made two pumpkin pies for my husband. I love to make pies!!!! My friend makes the best strawberry pie and it’s my favorite 🙂 I need to get her recipe. I love aple pie!! Although I don’t qualify to win one of the pie plates as I don’t live in the U.S., I am certainly going to try your recipe. It looks absolutely divine! Wish I could have a slice right now. This looks fantastic. My mom’s apple pie is my favorite – with a crumble crust – still warm from the oven with vanilla ice cream! This time of year, I think my favorite pie is carrot ginger. But overall, it’s cherry, hands down. So much so that I was gifted a cherry tree for mothers day last year! Congrats on the successful pie! Apple Pie is an absolute staple in my family, but I have to say that my heart truly belongs to a good slice of chocolate peanut butter pie, the kind that’s so rich that you don’t even think you can eat a full slice – and then you do, because it’s just that good. I have yet to make my own, though…maybe if I win I’ll have to christen the pie plates with my first attempt! Actually, I love nothing more than a crawfish pie for dinner. Yum! I love apple pie with a caramel syrup apple type filling. When I was 15 I made a lemon meringue pie for Thanksgiving. I did not get a single bite–had to split the last piece between my grandmothers. I now get a whole lemon pie each year to myself and it’s one of my favorite holiday indulgences! My favorite pie is a harvest pie, a combination of apples, pears and cranberries. A very close second is a chocolate pie, served with vanilla whipped cream. I love the way that pie looks. I sure wish mine looked that good. Right now my favorite is apple. It was peach this summer and by next spring I’m betting it will be cherry….Gosh, that’s like picking between your kids! A beautiful peach pie, it takes me right back to my childhood. Oh dear, do I have to pick one? I love’em all (especially cherry)! Apple is the first pie I ever made though, so I’ll choose it. I just (finally!) mastered pie crust using a recipe from Gourmet that uses butter and a tiny bit of shortening and the fraisage method of handling the dough. The method was a revelation! I also add sugar to the top of my pie, but not the egg wash. I find it makes the top crust less tender and feels gummy if it doesn’t get eaten right away. Maybe I’m doing it wrong because I see many people use the wash and not complain about it..like me! I only use a small amount of cinnamon as a seasoning in my pie because I love the apple flavor. I melt the butter and toss the sugared and floured apples in it before putting it in the crust. I use just enough flour/butter that it’s soft set as I do like a little sauce within. It’s the first pie I make for Fall..it’s my surrender to the season! I love the Marion Cunningham cranberry raisin at this time of year (or any time of year); it can be found in the Fannie Farmer cookbook! YUM!!! Hmmm…I have the most wonderful memories of my mother’s French Crumb Apple Pie. My brothers and sister and I would steal the big crumbs off the top so that by the time it reached the Thanksgiving table, the top looked like it was covered in sand! My favorite pie is a tie between deep dish apple and pecan. Blueberry is my absolute fave! May favorite pie starts at the farmers market and what’s in season, is there any other way to make the perfect pie? As for the dough, I love the mix of butter and lard preferably leaf lard, if out of leaf lard I will use shortening. 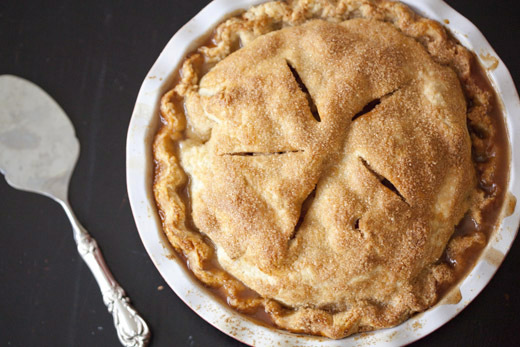 Your pie looks amazing, if may add apple pie is one of my obsessions too. Favorite would be apply pie, but I do have a wonderful recipe for a cream cheese pecan pie. My favorite pie is Caramel Apple Pie. Wow, look at all the posts! Peach has to be my all-time favorite, but a great apple pie is to die for–good for you! My Alabama grandmother swore by lard for crusts (that she made herself), fresh peaches or apples from her yard, fresh butter. I wonder what she used for the tart/lemon? My sweetie loves strawberry-rhubarb pie, so I’ve tried several different versions. Would love to have other bakers’ best version of this one! This looks simply scrumptious!! I can’t wait to try this recipe as apple pie is one of faves; however, my absolute favorite – and the one I’m best known for in my family – is Rhubarb Pie. Only trouble is, I no longer have it growing in my backyard (for some reason it doesn’t seem to thrive in a desert environment!). There is nothing like the smell of a pie baking in the oven. I can never wait for it to cool completely. I really like the idea of trying several different types of apples. Pie is my all time favorite dessert with cherry being my favorite and my mom’s lemon meringue second. Your apple pie would be my husband’s favorite for sure. This is probably sacrilege, but my favorite pie recipe is a savory pie with Indian spiced veggies on the bottom and creamy curried mashed potatoes on the top. Yum! Blueberry-lime pie is one of my favorites, but apple pie is right up there with it. I’ll have to get my hands on some lard to make your perfect apple pie–thank you for the recipe! My favorite pie recipe is still one of the first pies I ever made – a pecan pie that uses honey in the filling. (And yes, there was lard in the pie crust, tho nowadays I tend to use half lard and half butter.) Although I only make the pie for Thanksgiving and Christmas, I would happily eat a slice of that pie every day if I could! Zoe, this apple pie is just beautiful and sounds delicious. I don’t use lard and altho I started out making pie crust with vegetable shortening a la my mother, I found James Beard some 50 years ago and have never used anything but unsalted butter for pie crust since. I also use a mix of apples depending on what is at the State Farmers Market and am going to try your recipe, subbing butter for the leaf lard. As for the Emile Henry pie plate, what a joy it would be to win one. I have been trying many apple pie recipes to please a picky husband, and he has always liked bits and pieces of each recipe. I think I will try your apple pie and see if it will FINALLY make him happy. How do I love pie? Let me count the ways…oh my! There was my mother’s Gooseberry Pie, her Cherry Pie, and her Pear Pie with Streusel Topping. I also love Rhubarb Banana Pie, and another favorite from way back in the day, Blum’s Coffee Toffee Pie, that is about five inches thick in the middle. Oh, and a fresh Peach Pie right out of the oven. Then there’s the $7500 contest winner from the 50’s—a two-crust Slice O’Lemon Pie. And I can’t leave out Macacamia Nut Pie. I could go on and on. I guess you can tell I’ve been dieting. I might have to take a break. I love apple pie with a cheddar crust and have always believed in mixing the apples. I try to always have 1 McIntosh in the mix. (My maiden name was McIntosh and it’s just a point of pride to do this) My uncle had an old fashioned cider press and he claimed that the best cider came from a variety of apples. … apple pie with crumb/pecan topping topped with the best vanilla ice cream! I just made a spiced pear pie today. The crust has a little yeast in it but it is made like traditional pie crust. It’s delicious! Why oh why did it take me so long to appreciate my Mom’s lemon meringue pie? She won many ribbons at fairs with it, but I can still hear the little voice in my younger self saying “..lemon meringue pie…again?” FYI Zoe, I just made your Ultimate Carrot Cake. It was the ULTIMATE! I grew up eating dutch apple pie that uses granny smith apples and a wonderful cookie dough crust. For some reason we only make it for the holidays. This might just have to be my first apple pie ever! I can’t beat the idea of an apple and cinnamon pie.. Just the smell would justify making it! My grandmother used lard in her pie crusts too. Made me smile reading your post. Thank you, for a forgotten memory. I would have to say that my favorite pie is pumpkin, not because I like it but It has the best memories for me. My grandma used to make one extra pie every thanksgiving to send home with my uncle. Who thought her pumpkin pies were about the best thing in the world. After she passed, I continued the tradition. So to me pumpkin pies are my favoriate! My favorite pie recipe is the one my kids constantly ask me for when raspberries are in season — Raspberry Dream Pie. The reason it gives me such a kick that they request it is, it’s actually pretty healthy (AND very tasty). The secret ingredient is tofu, but shhh…don’t tell anyone! This apple pie looks amazing! I also have one that is my family’s favorite-it has a caramel and nut drizzle on top instead of a dough. Also very good! Pies are on my “to cook” list, though I need to do a lot of adjusting for the diet of myself and my boyfriend. I’m trying to start a vegetarian lifestyle (no lard anymore! ), and he is deathly allergic to cinnamon. Especially at this time of year, with apple and pumpkin pies, cinnamon is in everything! I’ve got some experimenting to do! My grandma has the best recipe. As good as yours looks, I would never want to find one I like better! I would feel disloyal. I try your recipes and they are always fantastic…so, unfortunately, this one I have to avoid! I love most pies, and apple is one of my favorites. But I recently began making Marionberry pies. Oh so good! After 28 years of marriage, and making lots of different pies, I must say my husband’s favorite is still apple. There is nothing better in the fall than he & I going and picking apples, bringing them home and we make the pie together. YUMMY! What a gorgeous pie! Coming from Germany I am more of a Apfelkuchen in it’s myriad varieties kind og girl. My favorite one has a sour cream topping. However, this really looks intriguing and I would love to try it in one of the lovely pie dishes. What a FABULOUS pie! I’m going to try this one. My VERY favorite is cherry pie, from my own pie cherries that I can every year. SOOOOO good! LOVE your web site! I am still trying to perfect my strawberry-rhubarb pie. Trying to grow my own rhubarb, but this is a challenge in coastal Virginia so I still buy it. I found a recipe my husband FINALLY loved, just as yours finally loved your apple pie, so now I just need to perfect my crust and all will be well. I agree with the lard, but my recipe actually calls for vodka instead of the white vinegar. This may be to pamper or appease the cook, but that’s okay by me. My brother recently had seven bypasses, and this was the pie he wanted so now I have two men who like me! That is one beautiful pie — can’t wait to try it. My favorite pie has to be cherry pie (made with tart cherries of course). There’s nothing special about my recipe other than I only make it once or twice a year so we always make much ado about it. @Barbara I too love Apfelkuchen and haven’t made it for years — may have to give that a go too. I love, love pies! That is how we celebrate birthdays around here. My favorite is any kind of fruit pie. I love apple pie and the recipe I use has a boiled glaze that you pour over the apples and brush on the top crust before baking. My favorite pie to make is Chocolate Pecan! This is really tough picking a favorite since I like so many different ones. But I think I will go with a recipe that my mother got from her mother, raisin walnut pie. It is rich and buttery and over the top. I even won second place with it only being beat out by a pie that had chocolate in it. I knew it would be hard to beat anything with chocolate but I was happy with second place. 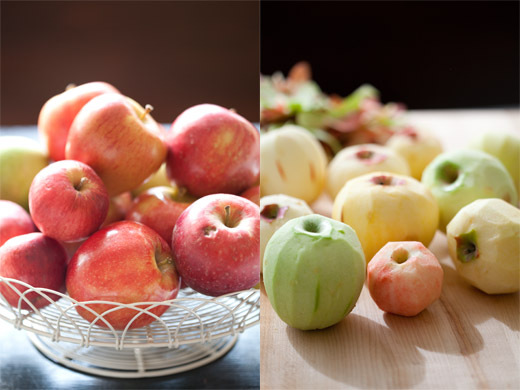 Love apple pies and your photo with the different colored apples was a delight. I love thin, super-tart lemon pies with a buttery crust. There’s no better combination. Lemon chess pie is definitely a favorite–so easy, so delicious. I also adore the cranberry pie in Beranbaum’s Pie and Pastry Bible. My favorite pie recipe is for Kentucky Pie (more commonly known as Derby Pie, though that name is trademarked). Oh man, sooo good. But my husband’s favorite is apple pie. It’s actually the only recipe he knows how to bake. I will have to try this one out. My favorite pie is an apple pie. Is there anything better? It absolutely has to be served a la mode. The simplicity of a really great tasting apple at this time of year cannot be beat. I have very little experience with pie crusts but will attempt this recipe and have no doubt it will be great and already know my husband will be very grateful! Apple pie is definitely a favorite with many folks. It is always a hit with any dinner party. My husband loves it, but the crust has to be perfect. I am going to try this pie to see if it is as successful with my husband. Have you ever tried a Pear Pie? Basically the same recipe as an apple pie, but use pears instead. 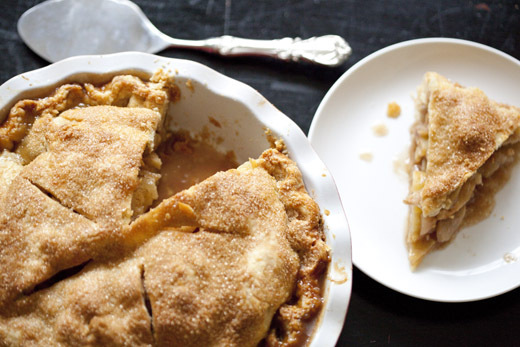 The texture and taste surpass – you will never want an apple pie again! My favourite would be pumpkin pie. My kids love it too! I can’t wait to try this! I love to make pumpkin pies during the fall and holiday season, but this one might trump as my new favorite. 🙂 Thanks for the giveaway! Your pie reminds me of the way my Mom made her’s. She’s been gone a year now and I would love to make a pie in her honor. Thank you for the beautiful step by step instructions. My favorite is Pecan Pie! And the 2011 Louisiana Pecan Festival is almost here! I’ve never been able to make a pretty apple pie. I’ll have to try making this one using your helpful hints. I love the way you detail each step – makes me want to give it a try. Thanks! Hi Zoe, your baking is absolutley beautiful and I love it! My favorite type of pie is a double crust berry pie, filled with fresh and local berries. The combination of blueberries and raspberries is the perfect combination of tart and sweet and reminds me of endless summer days. Divine! 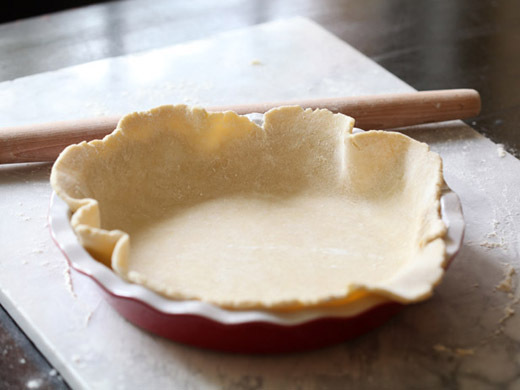 I’m going to try the lard pie crust this afternoon….thanks for the pie recipe. Apple is my Dad’s favorite. My favorite apple pie would have to be one with a crumble topping with a sweet apple filling I do not like tart apple pie. Pie reminds me of my Grandmas. Both always had great pies when I was a kid. But more recently a very dear friend told me to eat more pie, because great conversations happen over pie! Apple Pie and after seeing your pictures, your recipe may just be my favorite one! Can’t wait to make it. I LOVE, LOVE, LOVE pecan pie………the best! A mixed berry pie is my fav.However i need to try this recipe soon before i give the final verdict!! I love the apple pie that you bake and then flip over so the caramel mixture on the bottom oozes all over the top! Definitely fruit pies…apple, strawberry, blueberry, lemon, sour cherry…yum! We moved from MN to TX this summer and I am heartbroken over no apple season! I never knew it was possible to go through Honeycrisp withdrawal, but here I am. It looks soooo good. I will have to try making this soon. I love my Dad’s mud pie – it’s a frozen pie with an chocolate cookie (oreo) crust, a layer of coffee ice cream, a layer of vanilla ice cream, a layer of chocolate fudge and served with real whipped cream and sliced almonds. Yum. And, banana cream pie with whipped cream (no meringue) is my favorite. Your blog is great and the food pics are gorgeous. I love your story about your quest for the perfect pie – my husband doesn’t have much of a sweet tooth, so it always feels like a real victory when he likes something I’ve made! though I definitely have to try this apple now! I love apple pies, my favorite is a salted caramel apple crumb pie. I made one last week using Jonah Gold apples, utterly delicious. My second favorite is coconut custard. Great give away, Thanks! It’s a toss up between mixed berry pie and sweet potato pie with pecan topping! Strawberry-rhubarb is always my most-requested pie, but they’ve also become huge fans of the pumpkin chiffon pie I came across in a Penzey’s catalog a few years ago. Delicious! Apple Pie is just what I need. My favorite pie I’ve made is Pioneer Woman’s pecan pie. I’m madly in love with pecan pies and hers is the best I’ve found so far. 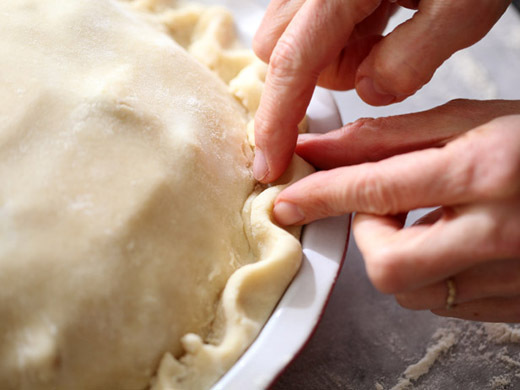 My mother-in-law is an amazing pie baker…delicate crust made with a light hand and no recipe! We love her apple, sour cherry and peanut butter crumb pies. I can make a decent Dutch apple, but the crust doesn’t stand up to Grandma’s! My favorite pie to make is pecan pie. I started out making this pie as a young bride some 35 years ago just using the recipe on the Karo syrup bottle. Since then I have made some changes to the filling and my crust recipe. I have never been happy with my apple pie so anxious to try The Best Apple Pie. Your apple pie looks soooo delicious!!! I love apple pie … and blueberry or blackberry pie too… I just never make pies because I’m not a good crust maker … I think I’m going to have to step up to the challenge and try your recipe! Wow, that sure does look good! My favorite pie recipe is from my Grandmother. No matter how hard I try, I have yet to achieve the mouth watering masterpieces that she once created. Favorite pie is strawberry-rhubarb. I roast the fruit in the oven with a little sugar and orange zest and then fill the pie shell. Delicious! My mom always made great pies but I can never get my pies to turn out as well as her’s did. I need more practice but oh, the calories!! This looks so great and it’s apple season in Michigan so it’s time to get baking and try this recipe. Thanks, it looks really great! It’s been a tradition in our family that apple pie is served during Christmas…that’s because that’s when the apples are abundant in the market. Maybe because it’s the holidays. But now being here in the US, Pecan pie has been my favorite and second to that is now the Pumpkin pie. aahhh, definitely the holidays are fast approaching. Will have to try your recipe of 5 kinds of apples. As usual, it looks amazing! I make a German chocolate pecan pie without corn syrup that is amazing! I love pie! does mincemeat pie count? : )I love a good old fashioned pecan pie a la mode! Peach pie is my ultimate pie! Pie is probably one of the best desserts ever! I can’t pick an all time favorite, but it’s a toss up between pumpkin, pecan, and buttermilk pie. I love buttermilk pie! My favorite pie is either bourbon pecan or potato pie with bacon. I love a good strawberry pie with fresh summer strawberries served with homemade vanilla ice cream! Yum! I love peach pies! Not made from canned peaches, only from fresh. So we only have them once a year or so. First, your pie is beautiful! My favorite pie is a cherry cranberry pie I make several times every holiday season. It is a tart-sweet delight with a crumb topping. I’ve been making this pie for 25+ years now and still love that first bite every year! My all-time favorite pie is Ann Hodgman’s white chocolate raspberry pie, from her Beat This cookbook. Believe me, a slice of that pie is a wedge of paradise! My favorite pie is an old-fashioned chocolate cream pie from The Joy of Cooking, but apple and pumpkin are made the most often here for my sweet husband! My favorite pie to MAKE is pumpkin pie. So easy and my kids never liked crust so I would make one in a crust and one just as a custard but in a pie pan. My favorite pie to eat is my mom’s homemade Lemon Meringue pie. Hers are just beautiful and super delicious. For years I admired her skills and how beautiful they were with the meringue stacked a mile high with golden drops of sweetness all over. When someone later told me that was the pie ‘weeping’ and you really didn’t want that to happen, I knew they were just wrong. Weeping meringue is the most beautiful thing in the world!!! My favorite pie recipe is Fanny Farmers rhubarb pie. I make it every spring. I also love coconut cream pie, and have a recipe to die for. My favorite, hands down is cherry. But apple isn’t far behind. Thanks as always for the great step-by-steps. So nice for the novice. Pie is my favorite dessert! 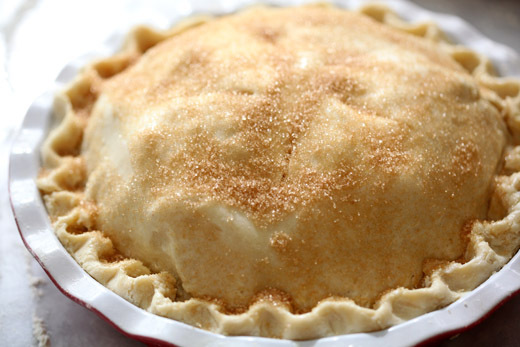 I love making Apple Pies and always use Jonathon apples, as they have the most wonderful flavor! Raisin, Pecan, Pumpkin, and Buttermilk Pecan are my “other” favorites to bake for Thanksgiving and Christmas! Actually, there is not a pie that I don’t just LOVE! Great recipe. I also like adding some dried cranberries in for a bit of sweet tart bite. Had a lot of troubles with pie crusts, hubby didn’t like the idea of lard and butter and crisco just weren’t cutting it. So I bought the lard, hid it and made his favorite cherry pie. He proclaimed it the best crust I had ever made and how come it was better then the one I made the week before. So I put the lard in an old crisco tin and don’t tell him what made such a huge difference. Hoping to win one of the pie plates in time for the holidays. well, all i can say is that the recipe is beautifully explained, specially visually, the husband story was fun to read… and that your apple pie reminds me of my mom’s precise instructions when i baked with her. My favorite pie is apple pie made with Minnesota Haralson and McIntosh apples. I hadn’t ever thought to do sugar on top of a standard double-crust apple pie, but that would probably be a good compromise between the Dutch crumb that my husband likes (too sweet for me) and a standard double-crust that I like. Thanks for the good idea! My favorite pie is pumpkin pie – my family has a fantastic recipe called “Hyce’s pumpkin pie” since the recipe came from a friend of my grandmother’s who was called Hyce, short for Hyacinth. My favorite pie is my Gram’s pecan pie. Here is the link http://holidayhelpings.com/2010/11/20/grandmas-make-the-best-pie/ this recipe was created before people realized how bad butter was for you… So you know it is good! My favorite pie recipe is an apple crisp. My family has been making them since before I was born! The favorite around here is pecan pie… I usually make several of them for our Thanksgiving gatherings and then again at Christmas. But early summer nothing beats Rhubarb pie! Olalaberry pie from our backyard berries. A taste of summer. I once had a recipe for an “upside down” apple pie: the single crust was a bit thick, and it was laid over the apple filling; the pie was turned out of the pie plate when done. The crust was crisp, the filling juicy and fragrant. It was wonderful!!! What a beautiful pie and what gorgeous pictures! Thank you Zoe for the great recipe instructions and your fabulous website. My favorite pie will always be my mother’s apple pie. Her great big heart and love was in every single bite. Even though my mother has passed, I always fondly remember her apple pie (made with lard in the crust, by the way) every Thanksgiving and Christmas. Thank you ever so much for inspiring me to make an apple pie this weekend in her honor and memory. I will surely use your recipe since my mother always made her pie without any recipe……a wonderful baker she was…….. Thank you again, Zoe! my favorite pie is an impossible coconut pie–no crust involved! My favorite pie recipe is for a caramel apple cheesecake pie. Cheesecake, chopped apples, cinnamon, drizzled caramel…it is to die for! But then again, pretty much anything that involves cream cheese is amazing! I remember my mom making some awesome pies with the sour cherries, plums, apples and pears we had in our yard. She would bake the pies and whatever leftover dough she had she would bake them with cinnamon sugar…yum! Brings back memories! Of would love to follow her footsteps and make her proud:-) making her an amazing apple pie like the one introduced above would be amazing! My favorite pie is made with whatever fruit is currently in-season! That makes it Haralson apple pie right now. I’m going to make one with a few fresh cranberries in it, because I love the color. Never thought to add more than one or two kinds of apples to my pies. Definitely will try your recipe. PS looking forward to the new book! My favorite pie was my grandma’s apple pie. Nothing super special about the ingredients, but the fact that she loved to bake for us, well into her 80s and early 90s, always floored me! I will never ever forget the taste of those pies. I wish she was still here with us. Looks Delicious! I always have troubles making pie but my favorite would have to be pumpkin! yum! The pictures alone are making my mouth water! Love that you used all kinds of apples. I need to make another apple pie soon. One of the best apple pies I ever had, had a crust made with half butter and half lard. I love making pies, but my favorite is a strawberry rhubarb pie made with Solo Almond Filling. I saw the recipe in a newspaper years ago and it turned out to the be the prettiest pie I had ever made along with being so yummy. I love all kinds of pies, but my favorite all time is rhubarb custard. Lately, I’ve been using the pie crust recipe from CI using vodka. In the past I’ve always used one with vinegar with great success also. I don’t have any apple trees, but I know several people who do that have been kind enough to share….bumper crop this year. I’m not sure what variety of apples I will be using, but I will make this apple pie right down to the crust with lard. Thank you for your wonderful web site. I visit often! I have always used butter but am going to try the lard. Just made my own lard for the first time and this will be a great use. I have lots of apples right now and will make this for Sunday dinner. Thank you for all the great pictures. I love sweet potato pie. And pecan pie! Sadly, I’m not much of a fruit pie person. Our family has always made pie. It’s our tradition, our thing, our niche. We even use pie to introduce ourselves to new neighbors or people we’ve met at church. If it’s warm weather, we’ll make our very own strawberry pie, with a bottom layer of cream cheese topped with sweet strawberries. It’s then chilled to perfection and eaten in 10 seconds flat! 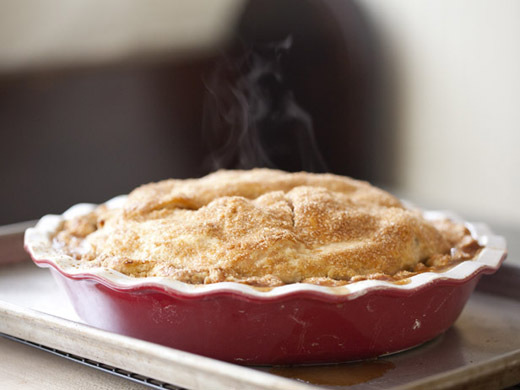 When the air is chilly and warm dishes are welcome, we’ll make our famous apple pie. The secret is all in the crust. The apple pie is definitely my favorite because no one has ever been able to duplicate it, and it brings back a wave of wonderful memories. Zoe the apple pie looks fabulous. My favorite pie is elderberry. It is getting harder and harder to find elderberries. I tried planting several bushes but they did not survive. I have always loved pie. My grandma used to bake a great apple pie and i loved it. This one is so pretty and what great pictures. I just recently found your web site and so glad i did. Everyone in my family loves pie. Strawberry rhubarb, pumpkin, pecan, apple, you name it my family will eat it. My favorite pie is peach-blueberry. Because, of course, it’s the kind my mom always made when I was a kid. And it just smells like New England summer. my favorite pie lemon meringue, but all attempts to make it have been less than stellar. I DO make an awesome pecan/cranberry pie, though. Mini pecan pies are a favorite followed very closely by chocolate pie & peach pie. My mother didn’t cook nor bake unless it came out of a box when I was growing up so didn’t get to experience a variety of pies. When my aunt came to stay with us for about 6 months was when I got to experience what for me was gourmet foods. Such happy memories. Our favorite pie has always been chocolate meringue! Apple, peach, huckleberry and pumpkin are all delicious as well, but for this chocoholic family, chocolate meringue tops the list! And I totally agree with using lard for the crust, the flakiness is amazing! We can’t wait to try your apple pie – even the pictures make me hungry! 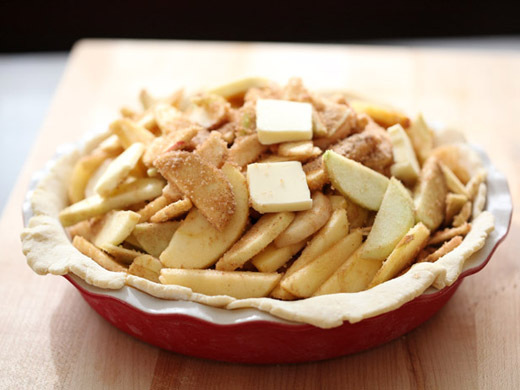 Bf contessa apple crostata but if I win this beautiful pie dish this recipe would be perfect. Ms Zoe, Your’s is all I can think about!Apple is my favorite of all times! And you got this Right! My favorite pie has to be pear crumble, i just love the sweet topping and the fruity pears. My mother made beautiful apple pies. She passed years ago. Seeing your photo reminds me of her baking; I miss her so. She too made her crusts with lard. Your pie is lovely. P.S. Sorry, left out my favorite pie…blueberry, or mixed berries. Sometimes called Bumbleberry. My husband loves apple pie with sugary crumb topping. The apples come from our own trees. My favorite so far is a peach pie recipe, a lovely thing that I made last summer 🙂 Good memories with that pie. Apple pie is my favorite and yours looks wonderful. I can’t wait to try it! My favorite pie recipe is Sweet Potato Pie with very minimal ingredients, not over mixed. My neighbor asks me to bake pies for her family every year. She likes to have chunks of sweet potato instead of a creamy mixture. They love them! my favorite pie recipe is a blueberry custard pie. a friend shared her secret recipe with me after years of begging and i am sworn to its secrecy. it is so creamy and delish. My Grandmother made the best apple pie ever with apples from a tree in her yard. Unfortunately I can not find that type of apple tree anywhere. And she always used lard in her pastry. I absolutely love all kinds of pie, but my favorite is an apple and caramel. My favorites are cinnamon apple pie and mixed berry pies. I can eat the whole plate! The keys to my favorite apple pie: a lard/butter blend pie crust using vodka in place of water; the best apples from local orchard: Cortland, Northern Spies, and Baldwins; lastly, freshly grated nutmeg. For a twist, once I added some concord grapes from a neighbor’s yard to my apple pie, and it was delicious, adding just an extra hint of grape-y sweetness. New England perfection! My favorite pie is my latest apple crumble pie. I used an all butter pie crust, three varieties of apple (I agree with you, gives the pie much more flavor). I used Pinata, Staymen and Golden Delicious. I added finely chopped walnuts to the crumble topping. I also used Saigon Cinnamon in both the filling and the topping. It was sublime! Fresh blueberry pie with a streusel topping, made even better if it is topped with my sweet corn ice cream! You may have the best pie crust that I have ever eaten. I made it last night, but instead of an apple pie — I used figs & strawberries. It was the crust that won everyone over. Thanks for the step by step pictures. Ahh that looks incredible! I can almost taste it by looking at the photos! I’ve been bringing my honey pecan pie to Thanksgiving for decades now. Still experimenting with crusts, but that’s fun work! My favorite pie is Chocolate Meringue Pie! My favorite pie was my Grandma Evelyn’s Pecan Pie. Seeing one always meant that there was a special occasion! Making one now makes me think of her, especially since I have assumed the responsibility of “Holiday and Special Events Coordinator” that she always held! Apple rhubarb or apple cranberry are always go to pies for fall. Love the way the house smells when baking!!! Love pie! Currently, pumpkin is my favorite…but I do love lemon meringue…and strawberry rhubarb…and blueberry…. Oh what a picture perfect pie you have made!! Guess it tasted picture perfect too 🙂 My greatest pie success was one year at Christmas an older gentleman said, “now this is how apple pie SHOULD taste!” It was MY (free form) apple pie. I’ve been pretty happy ever since! I haven’t made one yet this year. What’s wrong with me? I am agonizing over what pie is my favorite question!! BTW your apple pie is to die for!! 20 years- you got it!! I love my Raspberry Peach Crisp and my Cloudy Day Blueberry Apple Pie- But my all time favorite of favorites is drum roll… Boysenberry Cobbler from Great Grandma Cook’s kitchen–THE BEST EVER!! I can’t get fresh boysenberries out here but when I go west I’ll post it!! That looks like a fabulous apple pie! My favorite pie lately has been a peanut butter pie that has a chocolate glaze on top — yummy! That looks delicious! My favorite pie is black bottom banana cream, but my husband LOVES apple (he’s an all american guy). I think my current favorite is momofuku crack pie recipe– there’s a reason for the name! Your pictures make me miss home! My favorite is an Autumn pie we made when I grew up in Boston, apples, pears, and raisins. Yum! My favorite pie recipe is actually more of a cobbler. You can use any fruit. 1 cup flour, 1 cup sugar, 1 cup milk, 1/2 stick melted butter. Mix together pour into a pie pan, add fruit bake 350 for an hour. Yummo! My mother-in-law makes the best apple pies around. They are my husbands favorite. Found a neat trick from the people at Rosines Restaurant in Monterey, CA: instead of using cold water for the crust, use cold 7-up or Sprite. Makes a crust that is just a tiny bit sweet and flaky. My husbands second favorite is my blueberry pie made with blueberries that we grow ourselves. I have too many favorites to mention, but this one looks delicious! My favorite pie is lemon meringue! The best apple pie I have ever made was last week using fresh picked apples and using a cast iron skillet to bake it in. My husband and daughter loved it. Straight up, with ice cream, or covered in cheddar cheese it is the apple bomb! I have so many favorites that I make 9 pies for 7 people at Thanksgiving. I like the Coconut Cream from Cook’s Illustrated the best for eating. I like Crisco’s American Pie Celebration’s Jackpot Cherry Pie for taste and presentation (black cherry compote with cream cheesecake center layer.) And the one that has eluded me (although I am getting closer to duplicating) is Poppin’ Fresh Pies Sour Cream Strawberry, my all time favorite child/teen hood memory! Also…I have always used at least 3 types of apples in my apple pies, so I very much concur with this recipe being the best EVER…for texture and tartness/sweetness. I do the same with my potato salad..3 or 4 kinds of potatoes. My best pie is my Blueberry pucker up pie. Can’t tell the details (my secret) lets just say that lemon and blueberry are amazing together. My favorite pie is strawberry-rhubarb pie. It’s the best during the summer! And of course a helping of vanilla ice cream on the side is a must! My parent’s neighbor, mrs. Norton. I loved her banana cream pie and she was gracious to share the recipe with me. I love apple pie! I can’t wait to try this one and share it with my family! Can I just say any pie with a good, flaky crust? I don’t know if I have met a good pie I didn’t like. My most memorable ones are a zuccini “apple” pie which is delicious. I really do like pecan pie and pretty much any pie! My husband is lucky enough to have an October birthday – always celebrated with a birthday apple pie rather than cake. My grandma’s recipe does the trick. My favorite pie is a peach pie — fresh and in season, of course, and with ice cream! A little cinnamon and nutmeg highlights the flavor. My favorite pie varies by the season. I love blueberry in late spring when fresh blueberries are in. This time of year, there is nothing better than sweet potato. My favorite pie is pecan with praline bits in the filling. French vanilla ice cream is absolutely optional and recommended! I hope I win! I love dessert and I love to bake. Not sure if I really have a favorite but my husbands is pumpkin. Coconut cream sounds yummy right now! By the way, I have a beautiful daughter named Zoe who loves to bake with me! I love apple pie – and yours is beautiful. I have to say that my Mom’s peach pie is my all-time favorite, though. Pumpkin pie, made with freshly roasted pumpkin, loaded with spices and fresh cream. I have a recipe for a sour cream apple pie that is just excellent. I also like paper bag apple pie. Honestly, you can’t go wrong with any pie. I love my Bourbon Chocolate Walnut pie – it was a real favorite for a friend’s wedding. I love Pecan pie.. especially for Thanksgiving.. I love cherry pie with a touch of almond topped off with a scoop of chocolate Ice cream. Going to try this on Wednesday! My favorite pie recipe is from the Art of Baking booking by Sur La Table. It is for a banana cream pie. The part that makes this extra special is brushing a layer of melted chocolate on the baked crust prior to adding the filling. Keeps the crust from getting soggy. Wow….what a beautiful pie! And the pie plate is gorgeous….thank you for this opportunity. My current favorite pie (which changes often) is Pioneer Woman’s Dreamy Apple Pie….it is so comforting and just perfect. Hands down, my favorite DESSERT of all time is an apple pie– and believe the best apple pie is due to the apples. Like you, I’ve always claimed you have to use a couple of varieties to get the best pie. I have never used lard, but will give it a try. I am a huge fan of all pies, but my favorite apple pie is a recipe that include orange juice mixed with cinnamon and nutmeg, reduced to a thick syrup and poured over the apples before baking. Top it off with a buttery crumb topping. Yum!! My apple pie was the way to my husbands heart..After 23 years, I am still the apple of his eye!!!!! Growing up, my mother always made apple pie (one of her signature desserts), but I would only eat a bit while it was still oven fresh, if I ate any at all. I didn’t appreciate apple pie until I started to make them on my own (all butter crust). Now friends see it as one of my signature desserts. Apple pie is one of my favourites. My mum made the best apple pie-I never order it as it could never be her apple pie. You have just published my mother’s pie crust. She used this recipe for her pies for 60 years. Her rhubarb custard is my favorite. 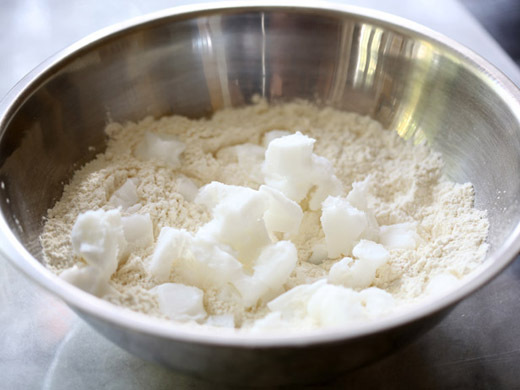 A hint regarding the lard; if you freeze the lard in its package, you can then grate it directly into the flour using the largest holed side on the grater. We generally keep a box of lard ready to go. Supposedly the best lard can be bought from specialty butchers as “leaf lard”. Favorite Apple pie recipe definitely has lots of cinnamon and a crumb top. You always give us such wonderful recipes and hits to succeed in the kitchen. This pie looks great! Thanks for all you do. I have an identical Emile Henry pie dish, but every time I make pie in it, the bottom crust is raw. This happens mainly with apple pies because I gave up after a few lovely looking pies with raw bottom crust. Not just soggy, but completely raw. Any ideas what I did wrong? I can’t seem to find any instructions on the difference in time/temp I should be using with metal/glass/ceramic pie plates. I am sure this is something I am doing wrong, but I hate to go through the effort of making a pie and having it ruined. My pie plate is lovely and I’d sure like to use it. To get the bottom crust to bake well you want to start with a high temperature, and have the pie on the bottom shelf of the oven. If your top crust is browning, before the bottom crust is nicely baked, then you need to cover the pie with foil. Thanks Zoe! I think I am following too many blogs. I missed this post, and could have really used it when making my cranberry cherry pie (which my hubby of 21 years today said was the best cherry pie he can remember). I can’t use lard, the pie must be parve… I used Mark Bitman’s recipe and use Fleischman’s unsalted margarine. Will try Crisco next time. The bakers on the FB Artisan Bread Bakers page talk about how bread baking and pie making are just opposites. Pie making makes us nervous! But you have the talent to do both well! awesome! I printed off your wonderful step by step. Is that a chilled granite piece that you use? 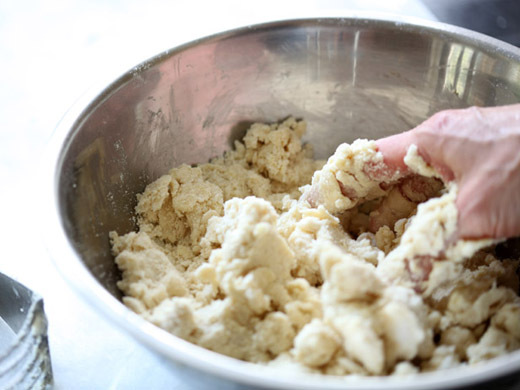 Is it better to mix pie dough this way than with a food processor? I just tried Crisco for the first time. Their recipe called for 4TBSP ice water, but my dough came together in 3TBSP. The dough, however, kept cracking when I tried to roll it out. I don’t know if it’s not enough water or the food processor. When I saw it coming together, I mixed a bit more in the food processor instead of adding more water, till it came into a ball. Oh Zoe. How have I missed your blog? I have your 5 min a day bread book that quickly has become favored reading. The title of the Best Apple Pie with your name caught my eye and I zoomed in for the recipe. Both parts of my apple pie win raves but I always look for improvements or variety. Your photos are wonderful. I usually cut down the sugar, add a bit more thickener, then toss in 3 – 4 Tbs of yummy Buttershots or a very almondy Amontillado sherry to the filling. I’ve been meaning to retry the lard used in my youth and will try it in your crust. It looks great. I would love to get the recipe that Louise (Oct 18,2011, # 33) described as “fabulous nutty whole wheat pie crust that is dying for this filling”. I agree, it sounds like a perfect pairing. Do you think it’s possible? Thank you for a great blog, fabulous recipes and keeping temptation at my door. I once had a creme brûlée pie that was delicious. well Kiddo…having eaten untold number of your pies, the Apple is my favorite. The pie I made yesterday was so good that my sons asked for another today. i prepared the dough for 3 more and put them in the freezer. Thank you. We live in Mexico and the Mexican apples are also very juicy. Beautiful pie and tutorial! Thanks for sharing. instead of the Turbinado sugar for the crust can i just use brown sugar? Brown sugar tends to clump, so you may want to use white sugar instead. If I want to freeze the pie for about a week, when should I do so? Before cooking it, after assembly? Or after cooking it? I have never made a pie, so I am clueless, haha. I would do it just like the pies you buy at the store in the freezer section. 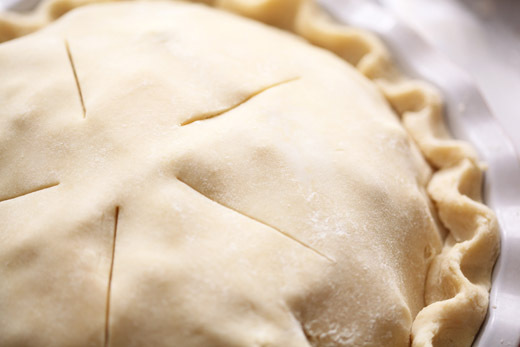 Assemble the pie, but don’t put on the egg wash or sugar and freeze it. Once it is frozen for about an hour, wrap it in plastic until you’re ready to bake it. I bake mine frozen. Just unwrap it, egg wash and sugar. The sugar may not stick, so you may have to take it out of the oven and egg wash and sugar again after it thaws a bit. 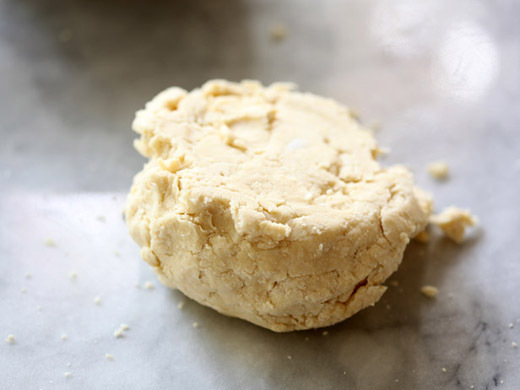 can I use butter for lard to make gallete crust? Hi Zoe, Thank you so much for this wonderful sounding pie. I have a question though about the crust. The recipe written in your post (contains egg and vinegar but no vodka) varies from that in the video. Can you give me the measurements for the video recipe? Many thanks! Can’t wait to try it. Ive made this pie the last 5 Thanksgivings!! Its the only thing my son asks me to bring for our Tday feast. I do cheat and use store bought crust.. Still, its FANTASTIC! Thank you so much for the recipe! So yesterday my daughter and I made the Perfect Apple Pie. When she printed off the recipe once home after getting the groceries I thought that’s not the recipe. I thought it was the Best Apple Pie. Instead the Perfect Apple Pie while it took us 5+ hours in the kitchen I’m hopeful when we slice into it the flavors will be incredible. Artisan Pizza and Flatbread in Five Minutes a Day is out TODAY, check out our Video and an Invitation!